When your family owns a Montana cattle ranch, it seems like selling beef to a friend should be easy enough. David Balatero, an old boyfriend’s bandmate, wanted good meat from a small ranch, and he knew my family could provide it. Once while waiting in line at a trendy barbecue joint, I had described our slice of river valley land and the people who worked it. And for a holiday dinner at his house, I brought the prime rib. So when David said he’d like to buy some beef from us, I wanted to accommodate. Every year, my family puts aside a few animals for just this purpose. The rest get sold on the conventional market, but the calves that stay behind plump up on alfalfa until they’re ready to fill the deep freezes of our horse veterinarian or tax guy. But Balatero lives in Seattle, so if he wanted our beef, he’d have to pick it up — and I couldn’t blame him for not wanting to drive a Prius full of melting chuck for 10 hours through winding passes across the Rocky Mountains. There are a lot of Davids in the world: People who love beef, but who also care about the impact of our conventional agriculture system on farmers, animals, and the environment. They would like to support small ranches and producers who adopt more environmentally friendly farming practices. But a 1,200-mile round trip isn’t reasonable for everyone. To those folks, Seattle-based Crowd Cow might seem like a god-send: The online “cow sharing” start-up seems to promise beef you can believe in. Its mission statement uses phrases like “the very best beef from small, independent ranches” and “healthy, high-quality meat you can trust.” No Prius necessary. Balatero knows one of Crowd Cow’s founders (Davids are friendly dudes), so he started buying meat through the company soon after its launch in 2015. He now gets most of his beef from the website. The site’s sales pitch is working on more than just Davids. This summer, Crowd Cow went national, and its tiny team swelled from two to 22. As of this writing, the company has 14 job postings. Crowd Cow says it’s on track for $7 million to $10 million in sales this year. Every good foodie has heard the “know your food, know your farmer” mantra. I wanted to know what happens when that relationship goes online, so I decided to take a closer look at Crowd Cow, its critics, and its customers. Hang tight, there are haikus and hanger steaks ahead. With an approach that perfectly captures life in the modern Emerald City, Ethan Lowry and Joe Heitzeberg conducted research into their steer-selling partnership by walking up to Starbucks customers and asking: Would you crowdfund beef from a small ranch? Tech-friendly, food-loving Seattle replied: What’s the URL? Back in 2015, Lowry was a David. The brain behind the popular restaurant app Urbanspoon (now Zomato) wanted better beef, but he wasn’t satisfied with his options for getting it. Traditional meat shares require a lot of planning, he says, and farmers markets eat up Sunday mornings. So Lowry talked to his friend and fellow tech veteran Heitzeberg, and the pair decided to apply the crowdfunding model to meat. To bring their idea to life, Lowry and Heitzeberg met with Pacific Northwest ranchers who they hoped would become suppliers. The pair’s outsider, learn-as-you-go perspective is built right into their venture’s name: The ranchers pointed out that they wouldn’t actually be selling cows to Crowd Cow; they’d be selling steers and heifers. But Crowd Steer sounds like a failed early aughts message board, so the cuter name stuck. Within 24 hours of launching, Crowd Cow sold its first animal to a group of “steak holders.” Throughout 2016, the company expanded beyond Washington state. In January, Crowd Cow raised $2 million in funding; even the aptly named Joe Montana invested. So how does Crowd Cow work? On a recent weekday, I opened my laptop, typed in the URL, and plugged in my zip code. Crowd Cow offered me the chance to buy grain-finished beef from a 13,000-acre Washington farm owned by Hutterites (a religious group similar to the Amish). I wanted to see how it would work for someone on the East Coast, so I put in a Brooklyn zip code. This time, Crowd Cow offered meat from a tiny Virginia operation that practices rotational grazing. The Kalbi-style short ribs looked interesting. I could even earn free beef by encouraging friends on social media to join in to “tip” the cow. Otherwise, there would be nothing to do but wait for the rest of the meat to sell, and for the $30 ribs (plus $12.99 shipping) to arrive on dry ice in a styrofoam cooler. Crowd Cow offers slick marketing, full of frequent beef puns and lovely photos. It makes it easy and fun to buy beef. Mission accomplished! It’s offline, where the snout meets the grass (or doesn’t), that things get complicated. Farmers who grass-feed their cattle tend to be driving when you call. My interviews for this story were briefly interrupted when farmers stopped to talk to a guy at the tractor parts store, to plug a Bluetooth into the truck, and to close a gate to keep cattle from roaming free. Henry Giacomini answered the phone when he was pulling a trailer-load of cattle into the slaughterhouse parking lot. The California rancher sells about half of his 450 calves through the conventional market. It’s a system designed for efficiency; Giacomini finds an acceptable price for his animals and opts out of the rest of the story. Things get quite a bit less efficient for the rest of his calves. Giacomini winters some of the animals on a grassy lease five hours away. Because they’re not being fed calorie-dense grains like corn and soy, it takes at least six more months for his grass-fed animals to hit slaughter weight. He has to find retailers or restaurants who specialize in grass-fed animals to buy his beef. Although he can get better prices, slaughtering and processing the animals can take a significant amount of money. The larger payoffs, though, could be substantial. Those grass-fed calves aren’t contributing to Midwestern manure lagoons. They aren’t crammed into feedlots or quickly gaining weight on corn. Good grazing practices can build up soil and sequester carbon (this is not an idea without critics; here’s a pretty nuanced look at the science). Many ethical meat proponents argue that we should eat less meat and pay more for these better practices when we do. But although there’s growing demand for grass-fed meat, it doesn’t always pay the bills. Giacomini tells me that he would like to grass-feed all of his cattle, but it’s pretty risky. He can’t always find a natural buyer when the livestock is ready — and if he then tries to sell his steers and heifers on the conventional market, they’ll be too big, and he’ll lose money. Last year, Giacomini took a bet on grass-fed. He bought about 100 additional yearlings from other ranches to fatten up. This winter, people started getting pessimistic about the market. Giacomini was nervous. The animals were getting close to slaughter weight when one of his major accounts fell through. “I thought we were in big, big trouble,” Giacomini recalls. Then he linked up with Crowd Cow. Giacomini had a few phone calls with Lowry and filled out some forms. The company emphasizes transparency and asks about a wide variety of practices. Lowry advocates for variety in the meat aisle, so there aren’t many hard no’s with Crowd Cow. Ranches can’t use growth hormones, and antibiotics should only be used on sick animals, but that’s about it. Crowd Cow uses the information in the documents that producers fill out to craft a story about the ranch. Giacomini expects to keep selling to the company through December. Crowd Cow doesn’t do long-term contracts, but Giacomini feels good about the company and the partnership. He’s set aside calves for next season. Reminder my friend David Balatero? Crowd Cow couldn’t tell me too much about the company’s typical customers, but he certainly seems to fit the profile. He’s a software engineer in a progressive city. He occasionally frequents the farmers market and tries to support small businesses. He’s critical of Whole Foods’ and Amazon’s impacts on local stores, but sometimes buys from them out of habit and ease. Balatero dabbled in vegetarianism and feels himself being pulled back towards a mostly meat-free diet. Still, he loves the taste of meat. He’s a joyful, searching, progressive, tech-savvy eater. If I needed a ramen restaurant recommendation or a new tasks app, I’d ask him for both. Balatero has ordered from Crowd Cow 10 times, purchasing everything from oxtail to steak. All of his meat was grass-fed and came from Washington state. Still, there are some things that slip by even a knowledgeable Crowd Cow customer. In 2016, the company added grain-finished meat to its offerings. When I ask Balatero what he thought of the move, he admitted that he didn’t even notice. “Hmm,” he says. In July, Crowd Cow got a lot of “hmms” when it put very rare Japanese A5 Wagyu beef up for bid. Heitzeberg, one of the company’s founders, documented his trip through Japan’s meat markets on the site, which hyped the “world’s best beef.” Crowd Cow hosted A5 Wagyu explainers, Instagram quotes, and videos. There was even a haiku contest; the winning beef poet got a Japanese chef’s knife. At the time, Crowd Cow’s mission statement said it celebrated “healthy, high-quality, sustainable meat” from the “very best local farms.” The company only ships within the United States. “Japan is not local,” Danforth points out, wryly. 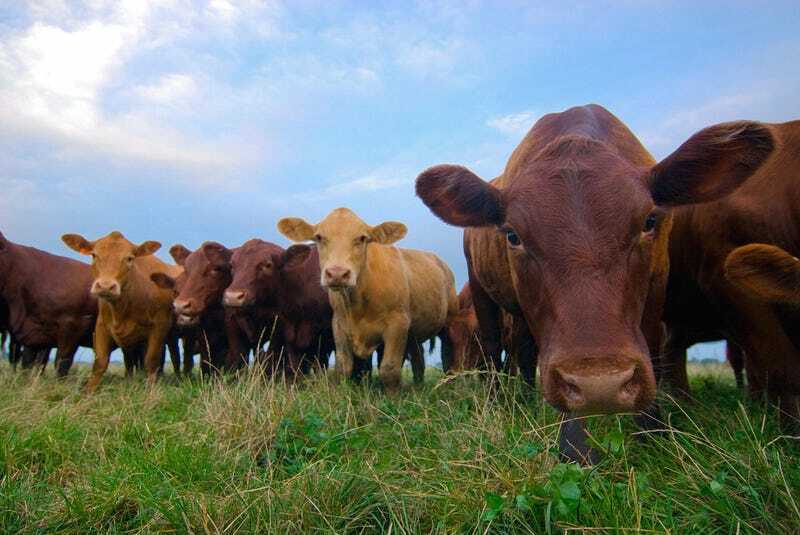 Imports make up to 80 percent of grass-fed beef sales in the United States. BN Ranch and Butcher Box, two big grass-fed players, source meat from the Southern Hemisphere. To producers struggling to do the right and risky thing in the face of cheap foreign meat, Crowd Cow’s A5 Wagyu move felt like a slap in the face. “Spend that money on us,” Miller says. About the beefed-over beef itself: Japanese A5 Wagyu cattle are weaned at a young age, kept indoors in segregated pens, and fed grains. This, to Danforth, is nothing more than high-end factory farming. They’re just “wrapping language around the confinement of a single animal which is supposed to be a herd animal,” he argues. Danforth posted about the sale on Facebook, and farmers, chefs, food educators, and Crowd Cow’s Heitzeberg stepped into the fray. Insults flew. “You’re as bad as the PETA people,” one poster wrote (fighting words in meat circles). Diana Rodgers tried to play intermediary. She’s a nutritionist and grass-fed beef advocate who had previously endorsed Crowd Cow. After the dustup, Rodgers distanced herself from the company because she worries about its lack of clarity on ethical meat. In the wake of the Wagyu outcry, Crowd Cow updated its mission statement to drop references to “local” and “sustainable.” Lowry says he understands why some advocates would bristle at those word choices in this context. But he disagrees that A5 Wagyu is akin to factory-farmed beef and says the animals are really healthy and well cared for. Still, he recognizes it’s pretty different from the image of pasture-raised American cattle. Lowry says the Japanese beef was “on the site for one day. Every other day has been pushing and promoting U.S. beef.” The company was open about the sale and farm, he says, so it fit under the umbrella of what Crowd Cow has been trying to do since the beginning: Be transparent. Get its customers the best possible beef. So would Crowd Cow buy meat from other countries, like Australia or Uruguay? Yes, Lowry says, but he would want to meet those farmers first. And, like the Japan sale, Crowd Cow would be clear about where the beef came from, he says. Crowd Cow customers seemed unfazed by whether or not Japanese beef is local or sustainable. Balatero says he thought, “I’ve heard this is amazing, and I want to try it once.” The cuts on Crowd Cow started at $79 and sold out in six hours. This weekend, the company posted a pre-sale announcement. More Japanese A5 Wagyu would be available in time for the holidays. Claire Herminjard, the Mindful Meats founder, says the U.S. food system faces two overarching problems: One, small producers need to earn a living wage so they can keep their farms. And two, environmentally friendly food needs to scale to the point where all communities can afford it. Consumers show an increasing willingness to pay for better-produced food. And that has enticed big players into the sustainable space. This isn’t necessarily the type of scaling that sustainable food advocates hope for. “VC funding and acquisitions are beginning to usurp the work of mid-level and low-level people trying to make change,” Danforth says. He points to Perdue and Hormel buying Niman and Applegate Organic, and says there are growing problems with greenwashing and a softening of standards. Earlier this year, the Stone Barns Center published “Back to Grass,” a comprehensive look at the beef market, difficulties along the supply chain, and what U.S. grass-fed producers would have to do in order to compete with foreign and conventional meat. I emailed lead author Renee Cheung asking if she could talk about “Back to Grass” in the context of Crowd Cow and Amazon’s interest in grass-fed meat. She told me that it was interesting that I had picked those two companies, because, in an ideal world, they could both go a long way toward solving those very different problems identified by Herminjard. Amazon could provide the scale needed to bring down the cost of U.S. grass-fed beef; Crowd Cow could help small farmers get a premium price — if it does enough to help customers understand what more sustainable beef looks like, and why it’s worth paying more for. Still, whether the company meant to or not, this is the role that Crowd Cow took on when it stepped into the world of ethical meat. Balatero says he fully outsourced his meat vetting process to Crowd Cow. This worries people like Danforth. Although he successfully argued against the use of “sustainable” and “local” in Crowd Cow’s old mission statement, he says the site’s updated language doesn’t promise much anymore. “You could call Perdue a family-owned organization,” Danforth says. Despite the concerns and criticism, a lot of people are hoping that Crowd Cow, or something like it (perhaps many things like it), can succeed. There are ranchers, like Giacomini, who took a bet on the company, and customers, like Balatero, who love its meat. After all, not everyone’s lucky enough to be able to haul a month’s supply of beef home in their car trunk after a weekend visit to Montana. And there are still plenty of reasons why we opt for the conventional market for the rest of our animals. This story was originally published by Grist and is reproduced here as part of Climate Desk.